Cabinets are exposed to many substances that cause stains. As you cook, splattered oil or grease in the air settles on your kitchen cabinets, and slowly builds to create an oily coating on the surface. This grease residue attracts dust, hair, and other debris to your cabinets, compounding the stains. While you can purchase cleansers and degreasers at the store, a homemade variety effectively cleans your cabinets and leaves them grease free. Fill a one-gallon bucket almost halfway with warm water. Pour in 1/2 gallon white vinegar and 1 cup baking soda. 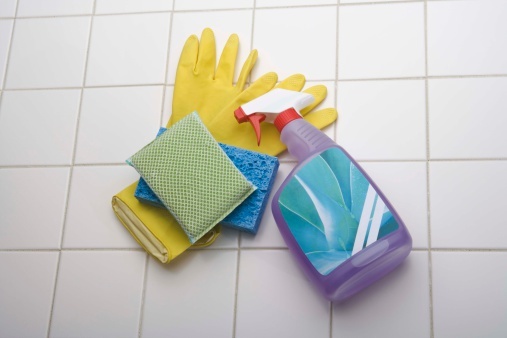 Both vinegar and baking soda are natural grease-cutters that are safe for a variety of surfaces, and will also remove accompanying grease odor. Stir the solution well to blend all three ingredients, and make sure the baking soda is mixed in well. Dip a sponge in the homemade degreaser, and scrub your cabinets with it, moving the sponge with the grain of the wood. Apply more degreaser as needed, and continue to wash the grease off your cupboards. Rinse your cabinets with a clean cloth dampened with warm water. Dry the surface with another clean cloth. How Do I Clean Water Marks From My Kitchen Cabinets?